Hire me as a Tour Guide! I’m a big fan of Harry Potter. I can still clearly remember how excited I am everytime there’s a new book or movie coming up. I cried hard, both when Dumbledore died, and when I finished reading the 7th book- knowing that I won’t be looking forward to the next one… forever. Harry Potter made my highschool days as magical as it can ever be. 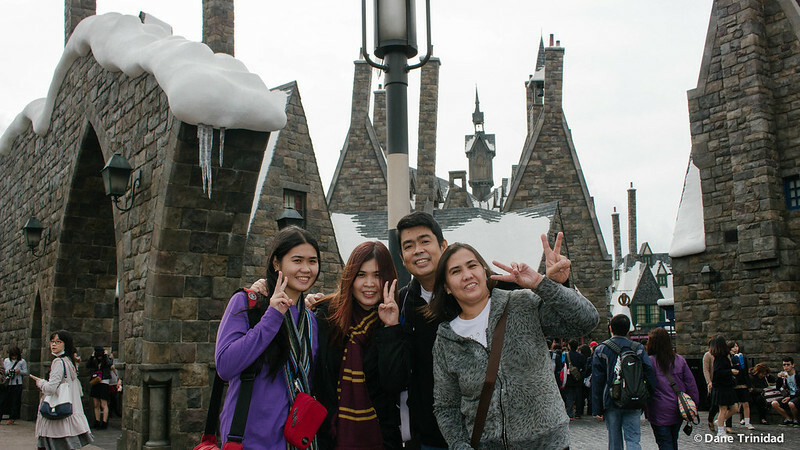 So, when I found out that there’s a Harry Potter theme park within Asia, I told to myself that I need to experience it A-S-A-P. Fast forward to November 2014, it all became a reality. My dream of becoming a witch “partly” came true. 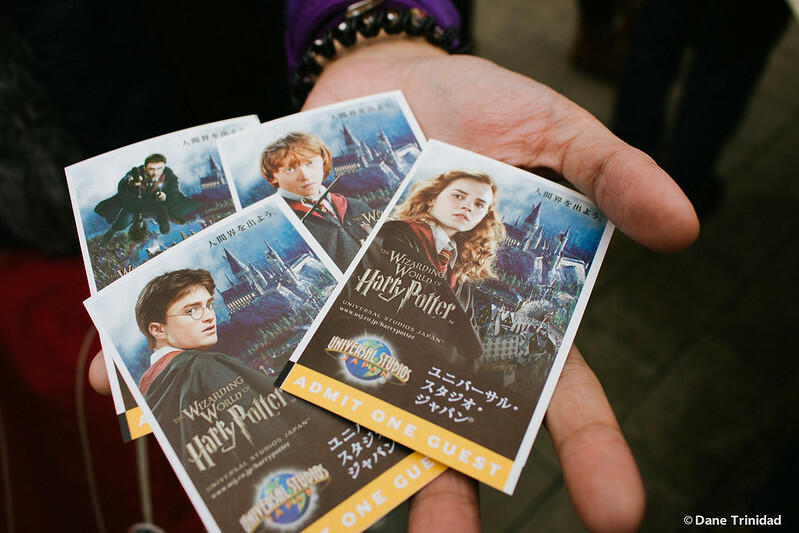 Our USJ Tickets! I kept these 4 as a souvenir. I intentionally planned our visit to fall on a weekday- to avoid the crowd. Honestly, there are more Japanese tourists than foreigners because even the locals can’t visit USJ easily ( it’s in Osaka which is around 4 hr by bullet train from Tokyo). 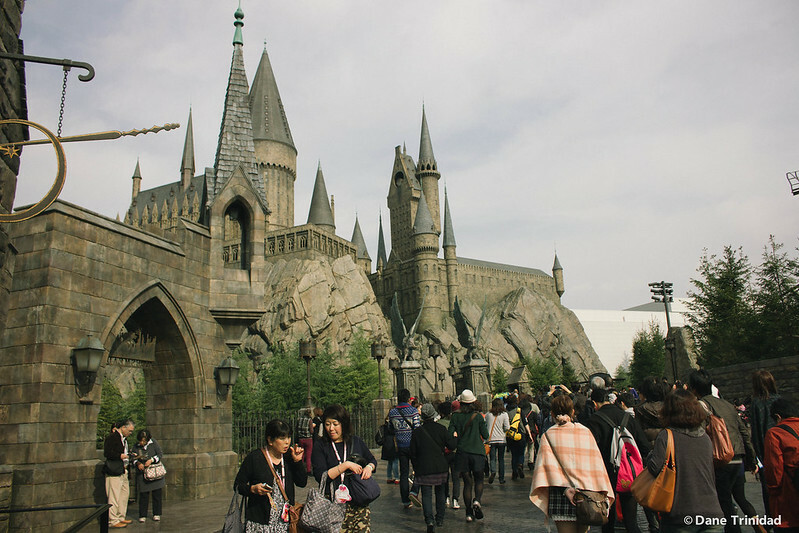 Based from the forum discussions, if the park has a lot of visitors, then USJ will setup a timed entry ticket which will indicate the time that you’re allowed to enter the Wizarding World of Harry Potter area. 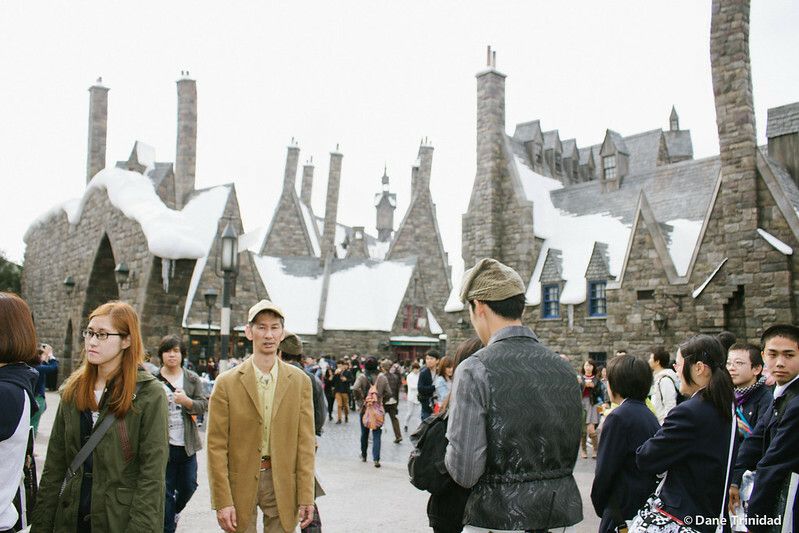 This is my expectation upon entry in the park- and as funny as it may sound, me and my sister plus most of the park guests (~90%) ran for our lives after entering USJ, and we all raced towards the Harry Potter area. 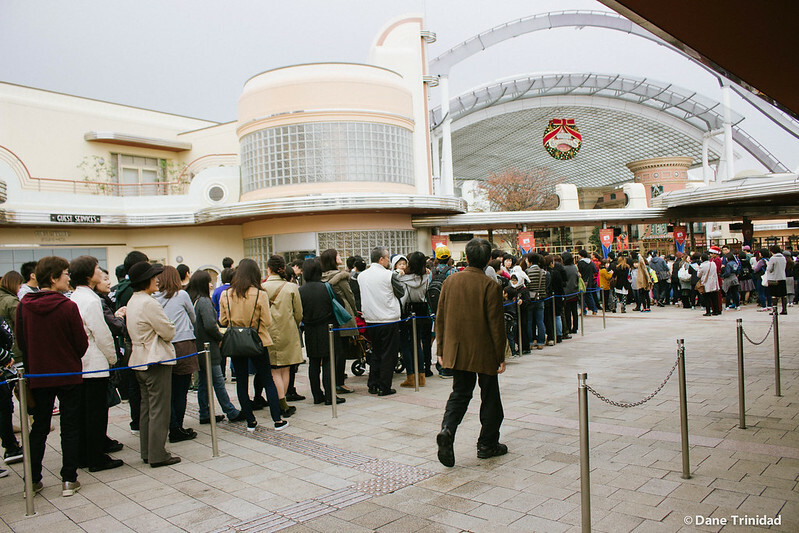 Too bad I wasn’t able to take a photo, but I guess the hype during that time ( ~5 months after opening of HP area) is still there. In the end, we discovered that there are not much people (for them) during that day so timed entry tickets are not needed. 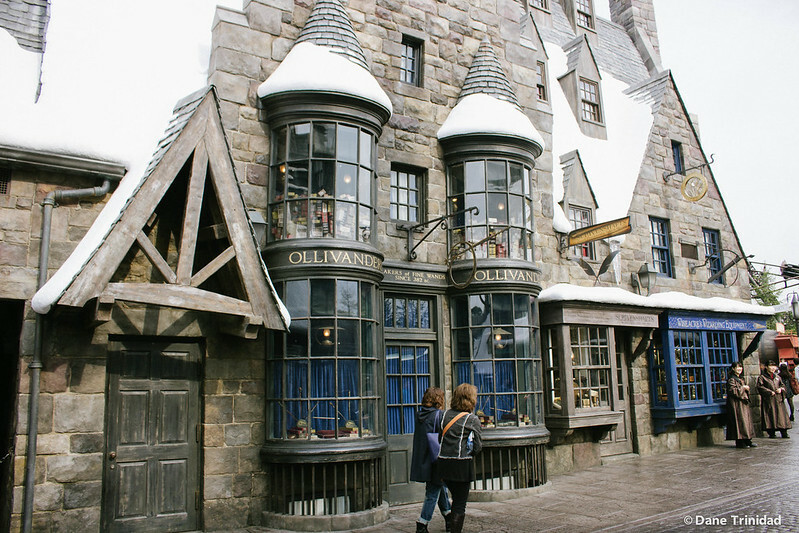 Ollivander’s Wand Shop! Go inside and let the wand choose you! 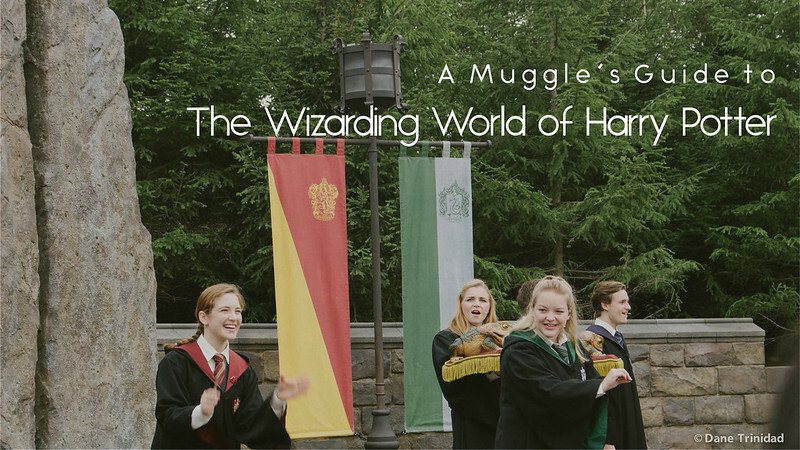 They even have a show for 25 participants where they will choose 1 lucky guest to experience being chosen by a wand! 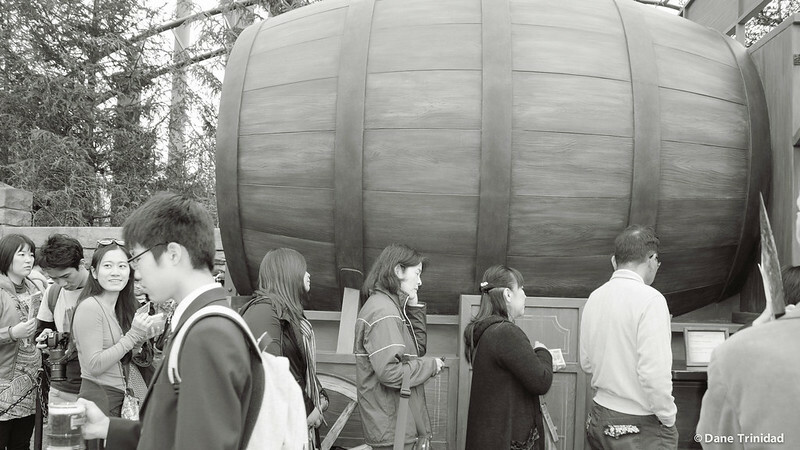 The queue for the Butterbeer. You can go straight to Honeydukes where there is little to no queue for the drink. Japan is definitely one of the best countries I’ve been so far. I’m sure a lot of people dream to go here too because of its anime-themed lands, good-mannered people, and heaven-tasting food. 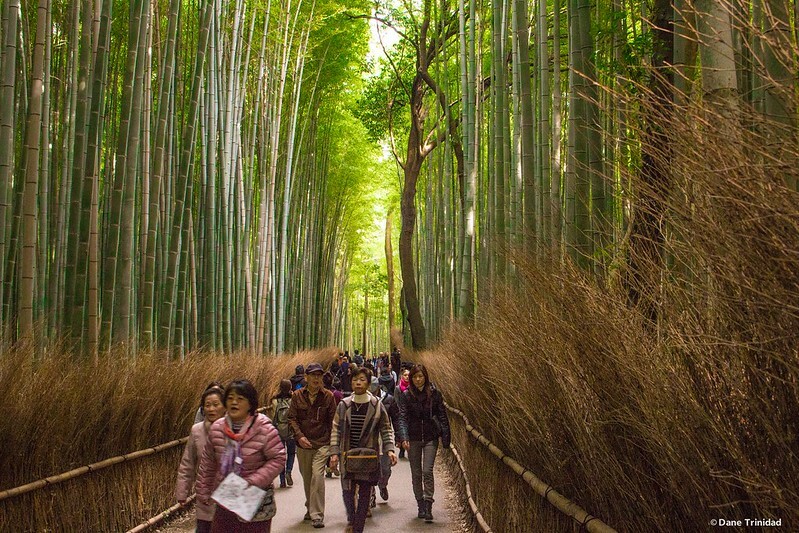 Good news is you can go here in a limited budget and still enjoy everything Japan has to offer! The first time I visited this country was last 2014. During that time, since we have limited days, we just stayed in Kanto region and spent $260 for nearly 5 days (check my post here). After the trip, I told to myself that I need to go back and bring my whole family as well. This dream came true 9 months after -product of my pisofare booking skills(astounding 4500 pesos roundtrip per person promo fare with baggage), and hardwork for our travel budget. The caveat is the duration of the trip is 10 days, plus it arrives and departs in same airport (Kansai) because the dates and choices are very limited with the consideration of promo fares. It’s quite longer than my original plan which means more budget needed. 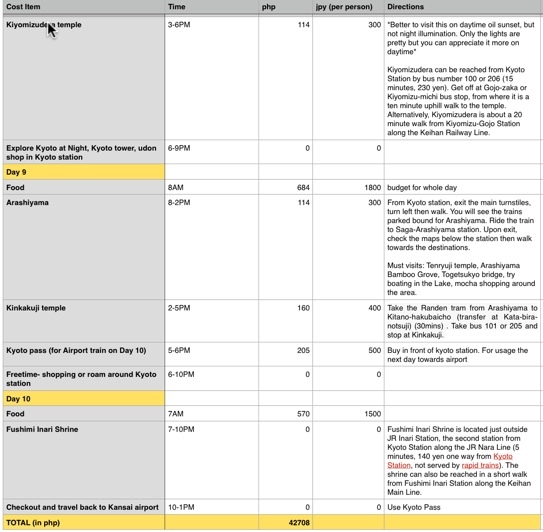 After several nights of planning and decision-making ( JR pass or overnight bus, etc), I was finally able to complete our itinerary for an epic Japan trip. 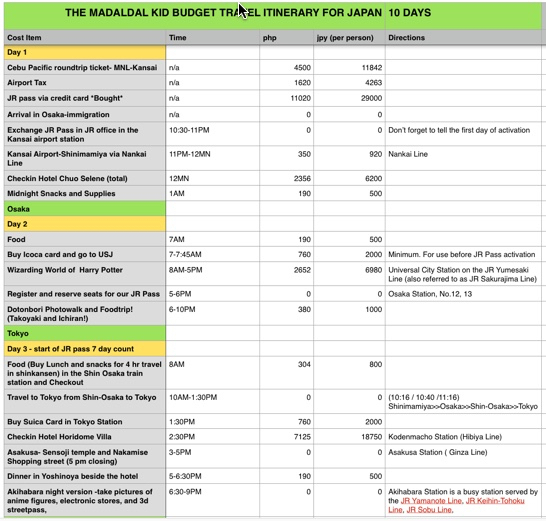 Without further a do, I’m sharing with you our 10-day Japan Budget Travel itinerary (Interprefecture). We only spent a total of 42,700 php (~$900) per person, All-in ( no hidden charges 🙂 inclusive of promo airfare, hotel, food, transportation, and entrance fees). 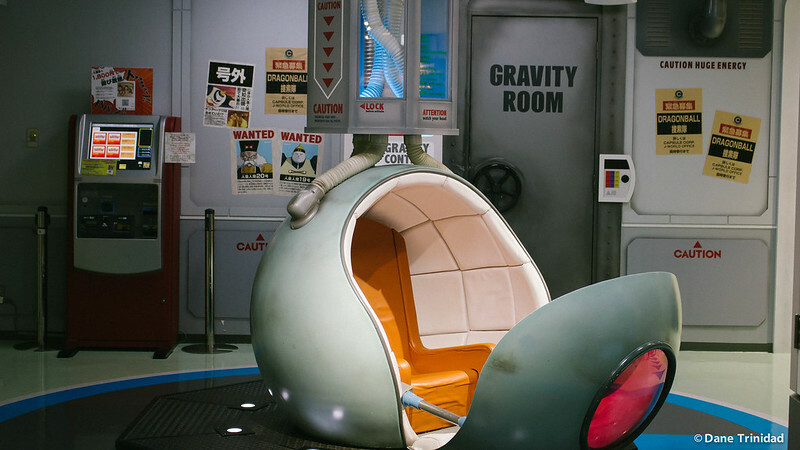 The good thing about here too is that I designed the whole trip with the consideration of comfort. If it’s budget, it doesn’t mean that you need to sacrifice the comfort of having your own room, a good bed and own bathroom. It’s one of the travel mantras of The Madaldal Kid. I won’t really push for the cheapest ever expenditure. It’s always the right balance between cost and comfort. Notes/Disclaimers: (a) Itinerary is quite conservative since I traveled with my parents so it’s not that jampacked so they won’t be tired. (b) We didn’t go to Disneyland nor Disney Sea since we’re not that fond of theme parks. (c) We stayed in not-so budget hotels but more of business hotels ( Hotel Chuo Oasis & Hotel Chuo Selene in Osaka area, and Hotel Horidome Villa in Tokyo) that are cheap. (d) the train fares are not mentioned since I bundled them in the Icoca/Suica card loads, and during the 7-day JR Pass, we didn’t spend much on fares given that JR pass covers most JR and local trains ( aside from Rinkai). (e) Some other itineraries can be cheaper but check if it includes a Kanto (Tokyo, Chiba, etc) to Kansai trip (Osaka, Kyoto, Nara, etc). Travel between these 2 areas can add up to some costs as well. 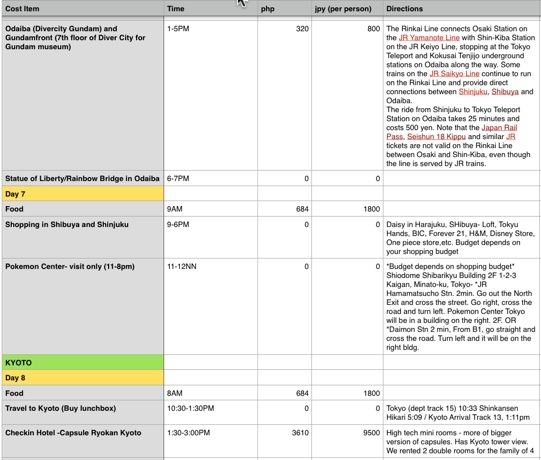 What’s the best way to travel to and fro Osaka/Kyoto/Nara to Tokyo – Purchase JR Pass or just use the overnight bus? Personally, I prefer JR Pass. You can only make value out of it if you are going to have at least 2 trips between Osaka/Nara/Kyoto to Tokyo, otherwise, it might not be worth it to purchase. It’s true indeed that overnight bus might cost half or lesser than a 7 day JR Pass for 29,000 JPY. However, if you are not a fan of long land travels (10 hours or more) plus the discomfort and fatigue after the trip, then better not take this option. I just realized that even if I can save an overnight hotel for the 10 hr overnight trip, the next day, I might not feel good and just waste one of my precious days in Tokyo. 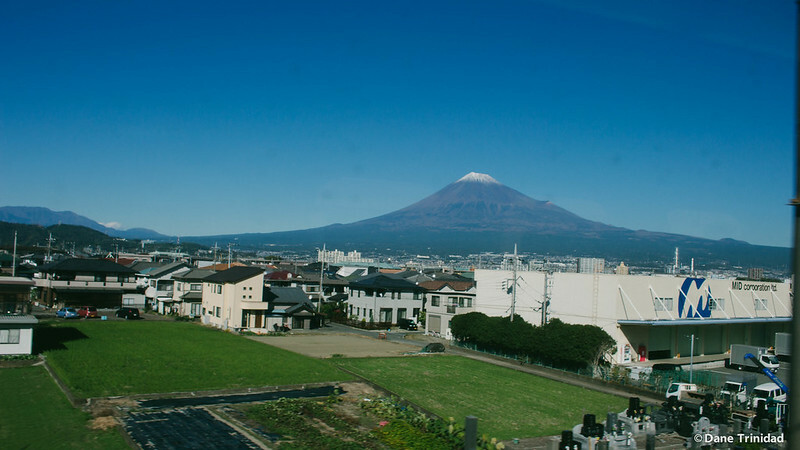 Riding a shinkansen is definitely an experience you should try. It’s even better than riding a good airline! 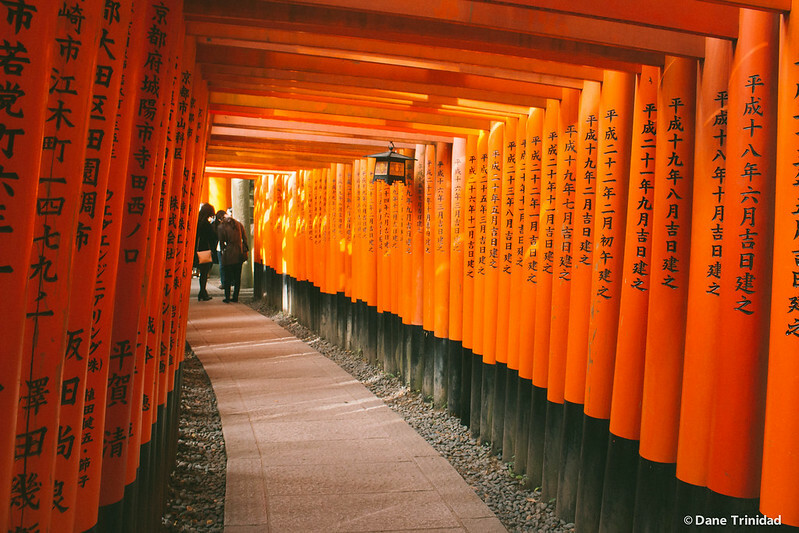 Should I rent a separate hotel in Kyoto and Nara or just stay in Osaka? Unless you’ll be staying in Kyoto or Nara for 2 days or more, I recommend to just stay in Osaka. It’s the center of the Kyoto-Osaka-Nara area, and train fares between Osaka – Kyoto, or Osaka-Nara are just around 1000 yen roundtrip (380 php) quite manageable. In all of my Japan trips, I always book Hotel Chuo Selene or Hotel Chuo Oasis because their rooms are clean, and the hostel is very accessible to JR Osaka loop line. Hostels in Kyoto are more expensive since it entices more tourists. During our November trip, I can’t find any cheaper options already even 3 months before the trip, that’s why we ended up trying the Capsule Ryokan Kyoto. You budgeted 500 yen for some of the meals? Will I be eating in a convenience store with that budget? No. 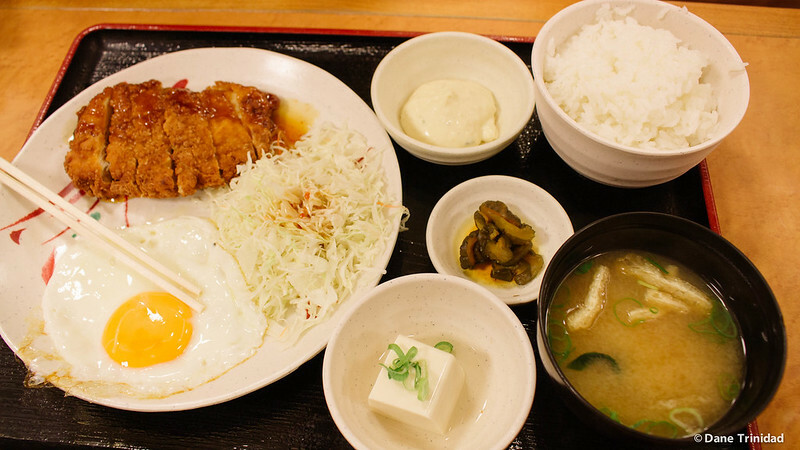 I keep on telling this to folks who haven’t visited Japan yet – food in Japan is cheap for its price and quality. 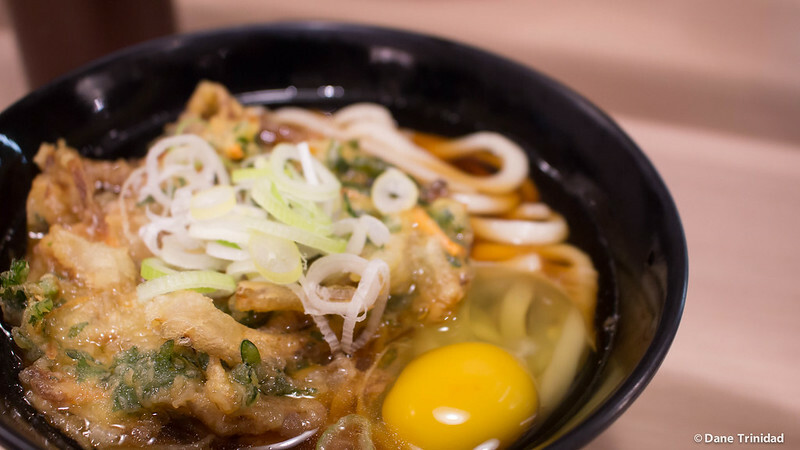 A 390 yen can buy you a good udon in a local shop in train station (airconditioned and clean). You can buy a big beef bowl from Yoshinoya with your 500 yen ( way better taste than the one we have here in PH). These are definitely great but cheap options right? Our first Japanese meal after our checki-in in Hotel Chuo Selene. We tried a local restaurant 2 mins away from the hotel. It costs 390 yen – roughly around 130 pesos. Not bad right? 420 yen udon from Shinjuku station. Yummy! Remember to eat it with a slurp to let the chef know that you like it! Where should I purchase Japanese yen here in Philippines? Is it easy to apply for Japan Tourist Visa? Should I apply first before purchasing a ticket? Yes! As long as you have legal and complete documents, you won’t have problems. You can check my detailed post about how to apply for a Japan Tourist Visa here. For me, I always buy promofare ticket first. Very good deals are hard to find so I always grab the opportunity, then I apply for the visa. If you feel that you have legal set of requirements for visa applications (COE, ITR, Bank statement, or even Affidavit of support), then don’t be scared. If you apply for visa first, then you aren’t able to find a promofare in time, you might end up being forced to buy an expensive plane ticket, or worse- not use your visa at all (which might be questionable on your next visa application). Where is the best / recommended place to stay in Tokyo, Osaka, and Kyoto area? In Osaka, you can stay anywhere near the stations of Osaka Loop Line. This line is basically the heart of Osaka’s train system and it will bring you near to any destination. My personal choice is Hotel Chuo Oasis or Hotel Chuo Selene very near Shin-imamiya station. It’s cheap , very clean, and very accessible (1 min away from Osaka loop line and 2 other local Osaka lines) . I always stay here whenever I go to Osaka/Kyoto area. 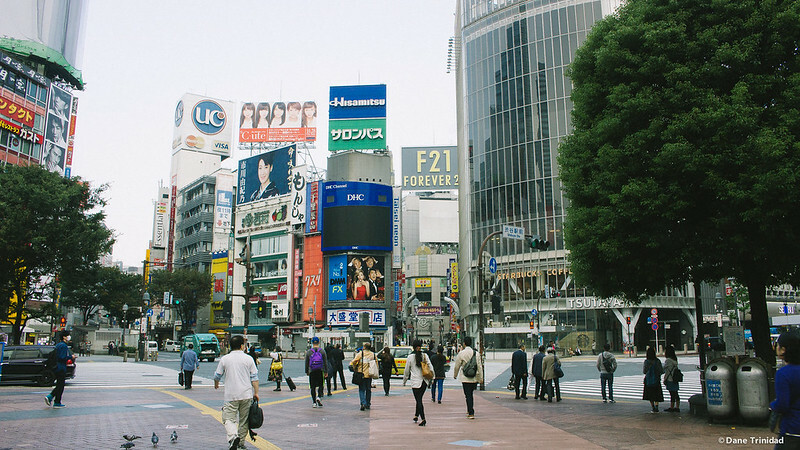 In Tokyo, stay in Shibuya or Shinjuku area. Both of these places have very good stores to visit even at late night (shopping, restaurants, crossing). There are tons of Airbnb places here, so just try to check. 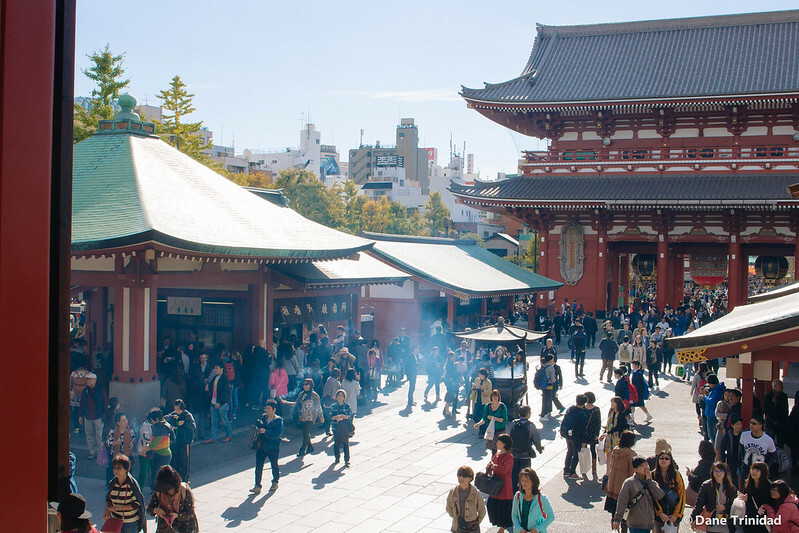 While it’s true that there are cheaper places in Asakusa area, I don’t really like the quiet night vibes in that area, and it’s quite far (around 30-40 mins by train) from Shibuya (other side) where most of the attractions are. (Shibuya crossing, Hachiko, Harajuku, Shinjuku, Odaiba, Meiji Shrine, Hamamatsucho, Kawaii stores in Shibuya like One Piece, Disney, Loft, etc). Reason too is, I’m a big fan of the lively vibes of Shibuya – seeing a LOT of people crossing the street with their own personalities, a LOT of shops here an there especially my top 2 favorites- Loft and Tokyu Hands). When we visited during the Autumn of Nov 2014, we stayed in Hotel Horidome Villa (near Tokyo station). In Kyoto, we just stayed near Kyoto train station since trains and buses all originate from there. We booked last minute so we cannot find any cheaper alternative, and decided instead to experience a high-tech way of staying in Japan via Capsule Ryokan Kyoto. Overall, I was very happy of the good service of this place, very clean, hight-technology and efficient rooms. How can I make my trip even cheaper? 42,000 pesos all-in still sounds too expensive for me. 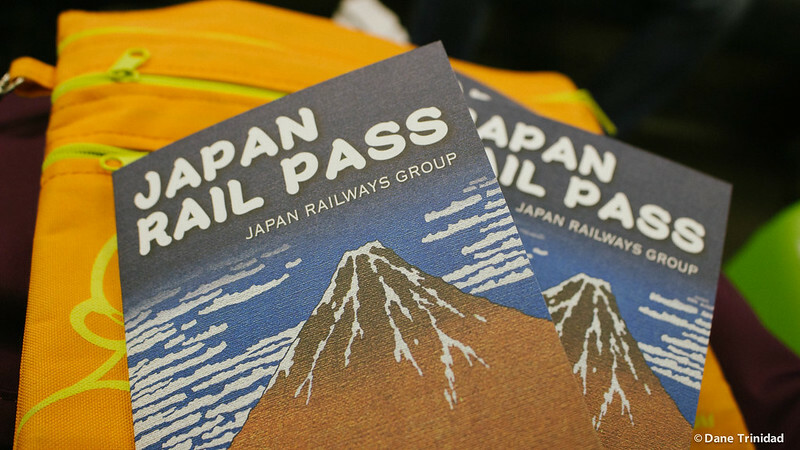 TOTAL without JR Pass: 20,000 yen. Third option (but not recommended): Just stay in one prefecture – either in Kansai (Osaka/Nara/Kyoto), or Kanto (Tokyo/Chiba/ etc). Going to Japan soon but don’t know where to start? 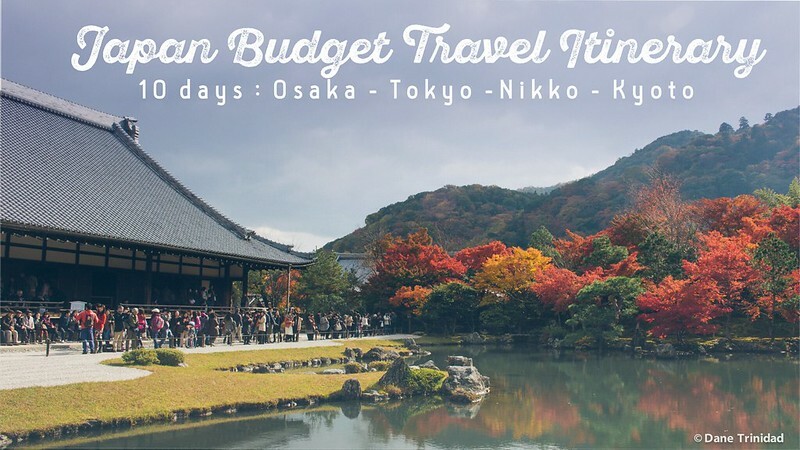 Try to avail of my customized budget itinerary to learn and be able to tour Japan alone! Just click here. 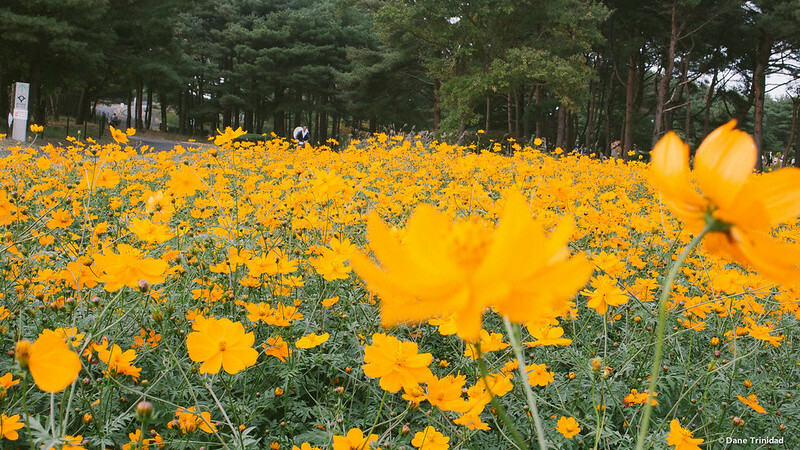 Aside from Spring, Japan is also a great destination every Autumn. 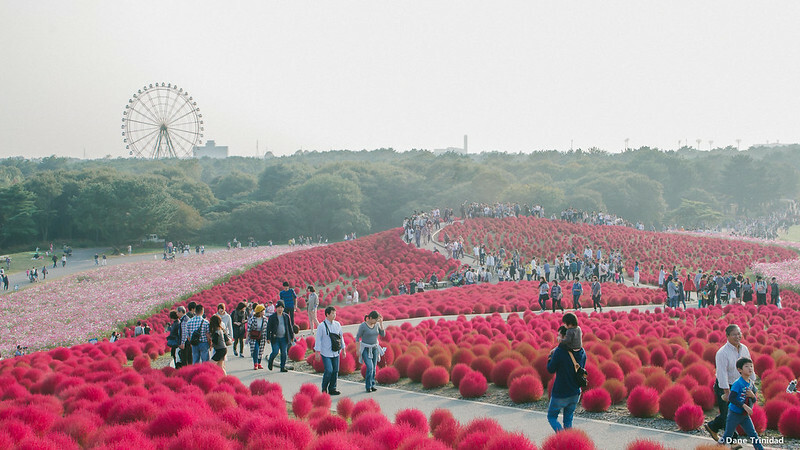 Luckily, I had the chance to come back again in the early autumn season of Japan (October) and immediately took the opportunity to go to Hitachi Seaside Park’s surreal Kochia fields. 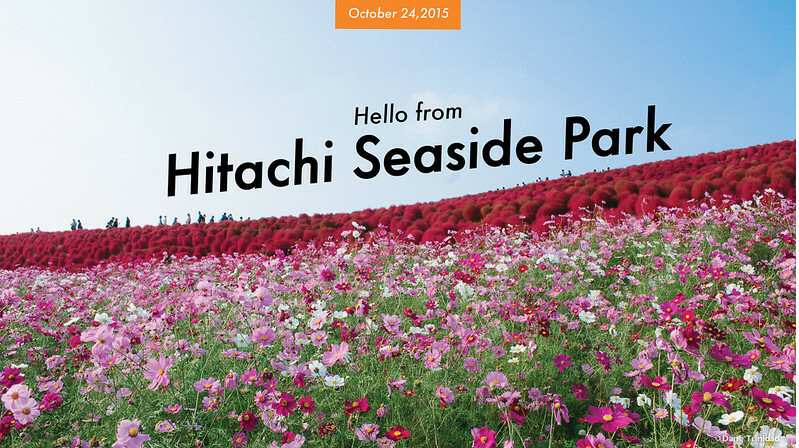 Hitachi Seaside Park is one of the largest parks in Japan famous for its seasonal flowers. 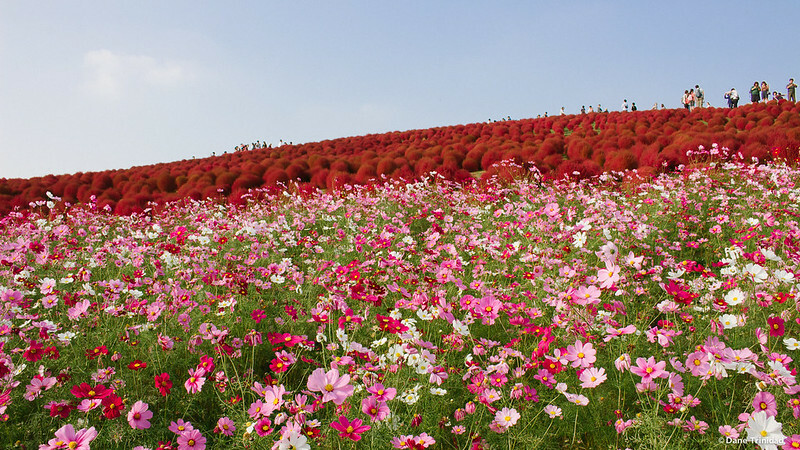 It’s mostly well known because of its enchanting Nemophilia fields every Spring, nonetheless, its Kochia fields offer a unique experience every Autumn. 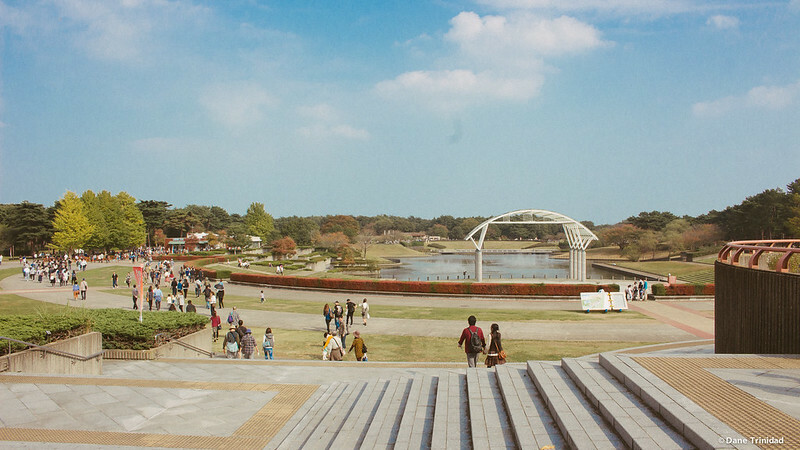 Upon entering the park, a large fountain and vast space will welcome you. As an avid traveler, I highly advise you to just rent a cute bike (with basket and bell) for only 400 yen (3 hours)- that is if you know how to bike. Couples who want to have a cheesy date moment can opt to rent the couple bike too! 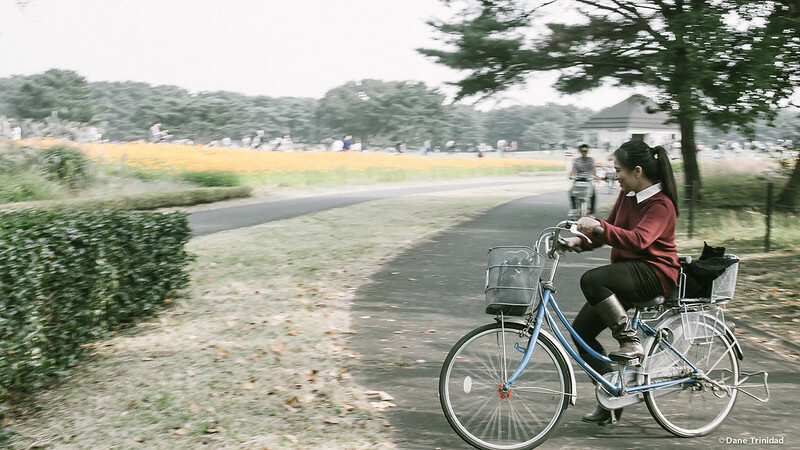 I can’t promise that touring the park using a bike will be easy, but at least you will be able to feel the cold autumn breeze while cycling around. There are some uphill areas too so prepare your knees and Gastrocnemius muscle with the torture. 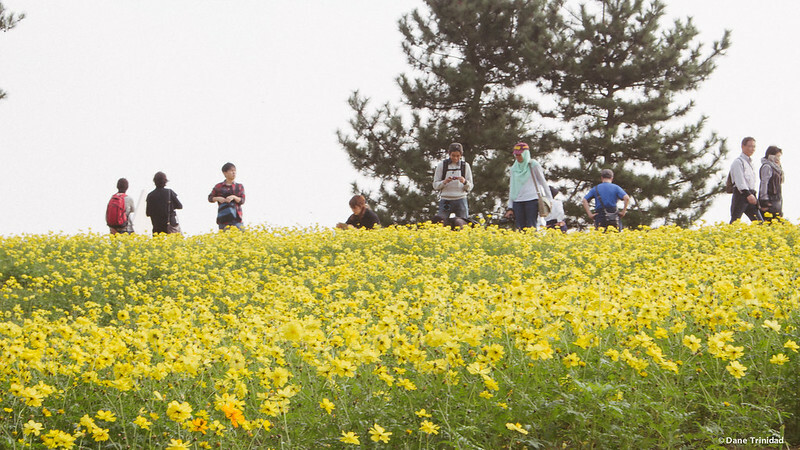 On your way to the park’s highlight (Kochia and Cosmos field), you will see some scenic flower areas as well. Personally, I don’t know the names of the flowers, but let the colors speak to you instead. 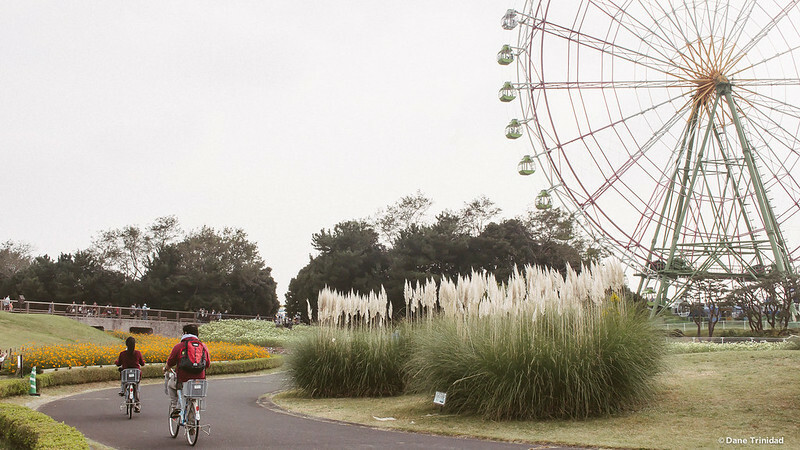 One of my favorite pictures is the Pampas Grass beside the Ferris Wheel, with my two friends! Creative shot! Just imagine how I was able to take this good photo while balancing on my bicycle! 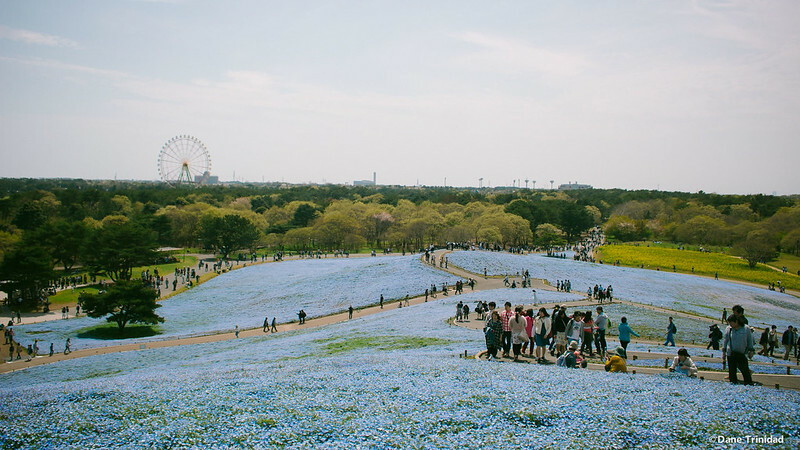 The saying “Stop and Smell the Flowers” is literally true in Hitachi Seaside Park. 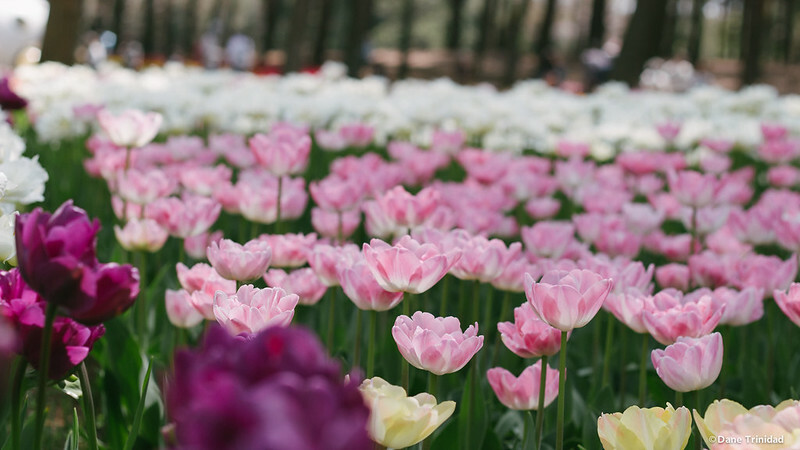 Once you see the flowers, you just can’t hold the urge to stop, take a photo, and smell the fresh flowers. (Just be careful with the bees). Rose, playing around in her cute bike. She looks like Kathryn Bernardo! Finally, after about 20 minutes of being lost, our navigator/friend, Cayao, figured out how to go to the glorious Kochia field. On our way, we also met another Filipina and together, we went to see the “Lorax”. Few minutes of downhill cycling, chatting, ringing (the bell), parking, and walking passed…. and behold the sight to remember for a lifetime! We are so lucky that we were able to be in this place during the peak season! 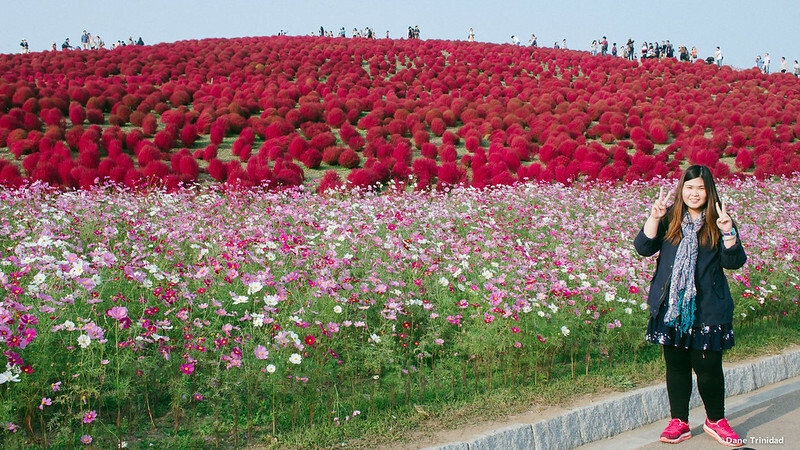 All of the Kochia bush are color red already and its also lined up with thousands of Cosmos flowers! Of course, we immediately took lots of photos followed by selfies and groupies! While roaming around the fields, all of us just keep on saying “Wow!”, “Ang ganda!” (It’s so beautiful), repeatedly. It is definitely the best landscape I’ve seen in my lifetime so far. 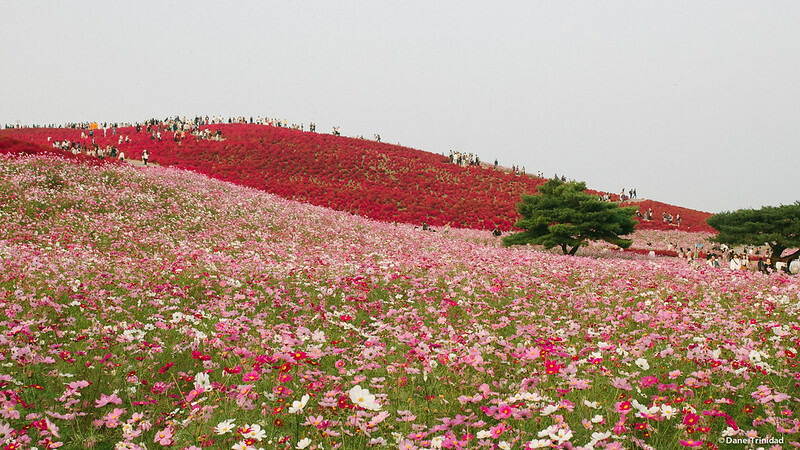 The landscape is also arranged on a hill, zigzag like path so it creates a wonderful panorama for your photos. My favorite spot is on top where you can see the Kochia, Cosmos, Skyline, and Ferris Wheel in a single frame. We spent nearly 4-5 hours roaming around the park, then at around 4pm, we had a very late lunch. For travelers who plan to visit in the future, it is better if you just bring your own bento box/snacks as the stalls inside are quite expensive and not yummy (plus the lines are very long). We left the part at exactly 5-ish PM and were among the last ones who returned the bike. I want to lay you down in a bed of Cosmos! My favorite photo of Kochia heaven. 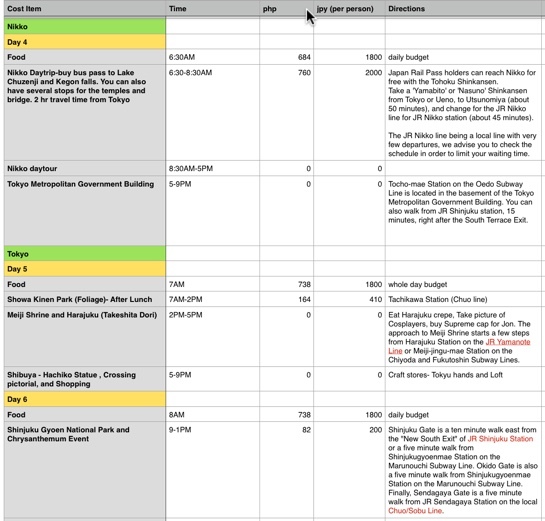 Before we end, I’ll share with you the directions and expenses so you can include it in your next budget travel! From JR Ueno station, take the train to Katsuta via JR Joban Line (Travel time is around 2.5 hrs). 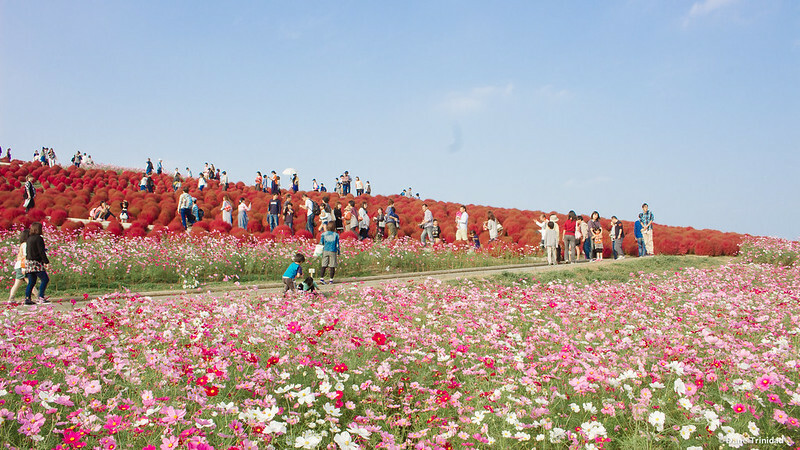 Outside Katsuta, you will immediately see the Ibaraki Kotsu bus stop bound for Hitachi Seaside Park. It will stop right in front of the park. Peak season of Kochia is 3rd-4th week of October. This depends on the temperature. When we visited, it’s October 24, and the Kochia are in peak colors already. Normal way: Cheapest roundtrip ticket from Ueno-Katsuta via local train is around 4500 yen roundtrip, and roundtrip bus ticket is 800 yen. 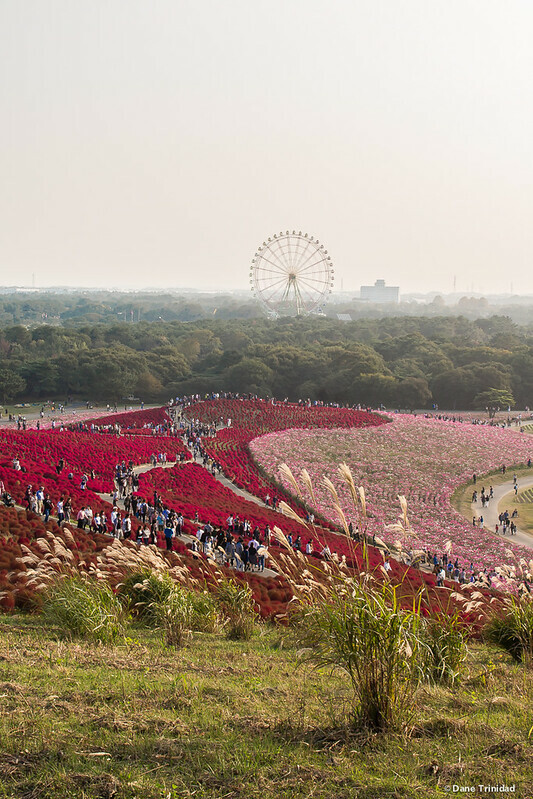 Total expenses from Ueno to Hitachi Seaside Park is 5300 yen. 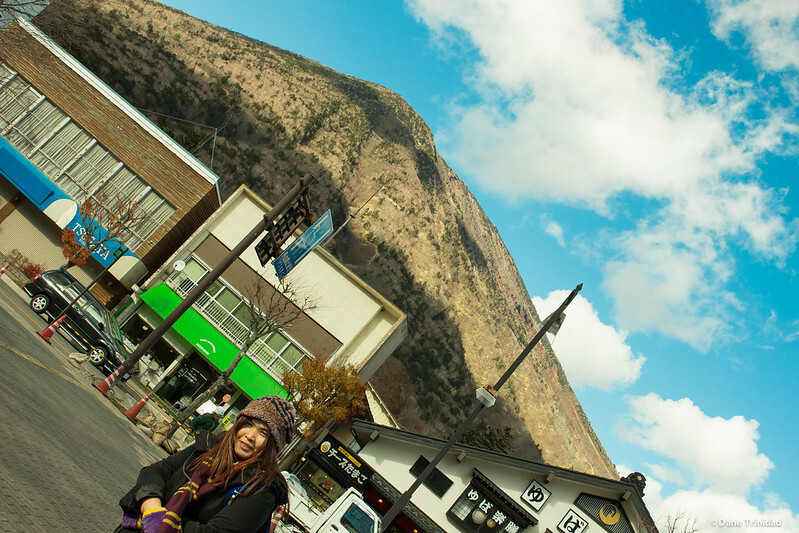 The Madaldal Kid recommended way: If you are a tourist, it’s better to purchase JR Kanto Area Pass worth 8300 yen. You can buy this from the Narita or Kansai Airport. It offers 3 days unlimited travels via JR Line in Kanto area. 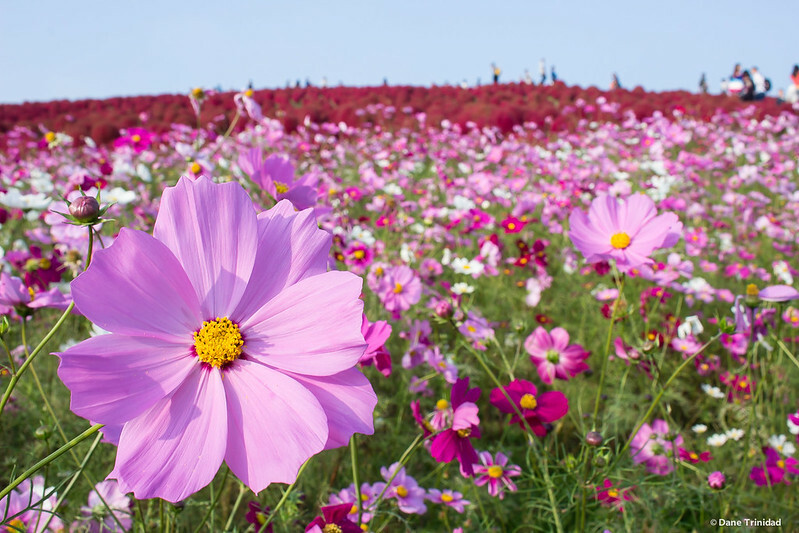 You can visit other famous destinations like Fuji Five Lakes, Karuizawa, Nikko, Yokohama, Chiba, Gunma, Izu, etc, thus you can definitely make a value of it! This will soon be replaced by Tokyo Metro Pass by December 18,2015 (same coverage plus additional Snow mountain destinations). Sometimes, oh well.. most of the time, I have daydreams of going to far away places. Being the traveler-at-heart slash street photographer that I am, achieving my travel targets is simply my Neverland. It’s my fantasy that I’m always turning into reality. It lets me fly off for a while in the busy streets of life and work. 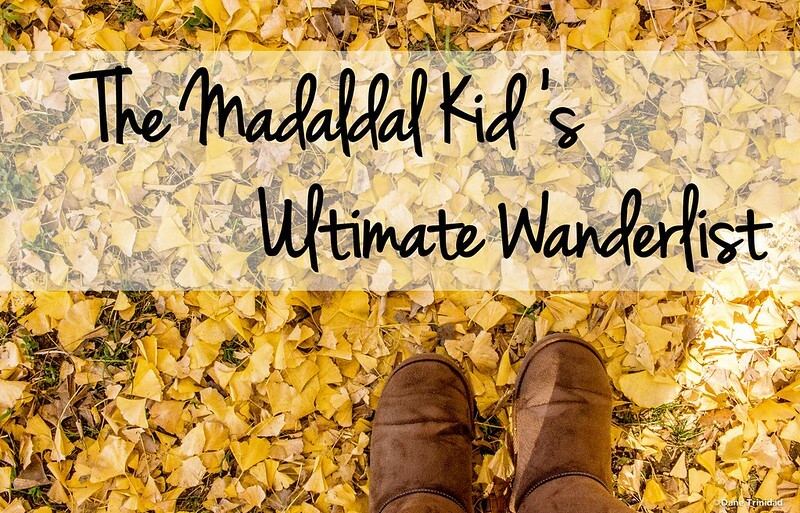 Now that I’m officially crossing the border of my mid-20’s (ughh), I think it’s the perfect time to share with you my ultimate Wanderlist! Hope you get inspired and create your own too! 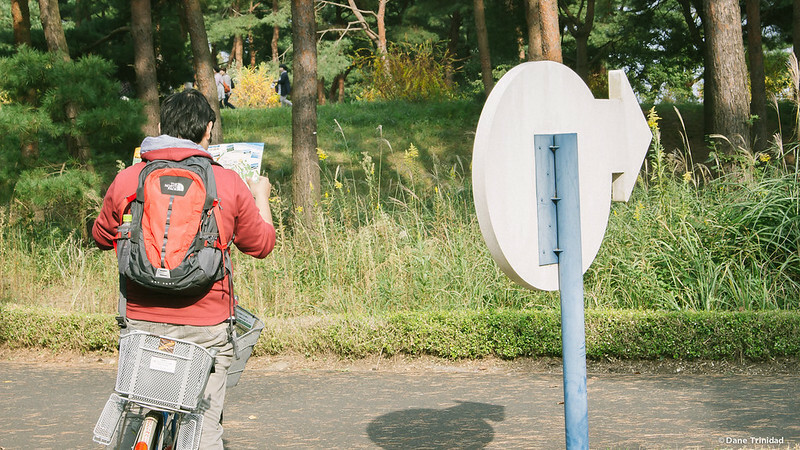 Note: As a traveler, I’m more of a photo explorer/ experience type and not the adventurer one. You will notice this in my dream destinations- where I’m more after the food, experience, magic, scenery, so there will be less or no beaches/extreme adventure places. If you’ve watched the 2010 movie Eat, Pray, Love starring Julia Roberts, you’re probably with me on wanting to go to this place, to “eat”. But literally, I really want to go here to eat a perfect, authentic Pizza Margherita and loudly say “Delicioso!”. One more good reason is to tour around the landmarks mentioned in Dan Brown’s novels (I’m a huge fan!) and look for the mysterious, hidden symbols mentioned in his book. Greece is the perfect destination for a romantic, picturesque getaway. I want to start the day with an early morning photowalk in Santorini’s signature white & blue themed villages, have a buffet of olive, wine, and cheese, then watch the best sunset of my life in Oia. I will also spend several days touring around the country for a Greek Mythology tour. Hopefully this long trip in Greece will turn me into the Goddess of Travel. Though it might be cliche, and too mainstream for a dream destination, having a picture with the Eiffel tower is still a heart jumping experience for me. But probably, one more reason I want to go here is to experience and eat as much good bread as I want! My plan is to wake up at around 6 AM, bring my camera, walk down a street full of bakeshops, try to feel and smell all of the oh-so-good breads, then eat random pastry + food at every store! For lunch, I will try a Ratatouille, inspired directly from the Disney movie itself. Who knows- it might be Remy who cooked it, right? Marianne is a Filipino budget traveler based in Germany,who simply wants to explore the world, experience unique food and culture, and take breathtaking pictures. She wants to inspire more people to travel and fulfill their dreams..in a budget. Get 19$ Discount on your Airbnb booking! Copyright Notice: This copyright applies to all images and posts of this website . Any of these may not be reproduced on another blog/website without the author's expressed written consent. All applicable laws apply and will be enforced. Disclosure: The Madaldal Kid shoulders all travel costs unless stated otherwise. I'm also welcome for any sponsored posts- just email mdtrinidad@gmail.com. Thanks!